"Easily one of the most innovative and imaginative works of zombie fiction I've ever read." 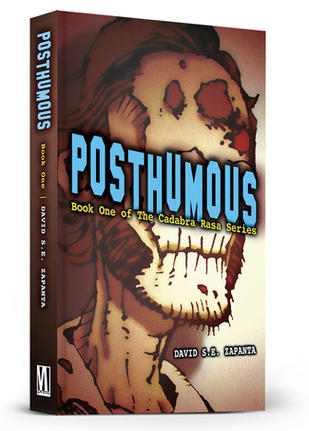 Welcome to Posthumous, an urban fantasy novel that explores a culture in which becoming undead is seen as a viable second chance. What if the idea of brain-eating corpses were just an ugly stereotype? What if the undead lived and worked amongst us? Would the living welcome their pulse-neutral brethren with open arms—or keep them at arm’s length? More importantly, what if you had a chance to become reanimated? Would you leave your starter life behind and embrace the undead concept of Cadabra Rasa? Bold, poignant, and at times darkly humorous and disturbing, Posthumous is must-reading for anyone looking for a new way to experience the zombie genre. Learn more about the world of Posthumous HERE. POSTHUMOUS related content and illustrations © 2018 David S.E. Zapanta. All rights reserved.